I have a confession: I LOVE plain nonfat VOSKOS® yogurt and enjoy eating it as-is! Despite being nonfat, it is so thick and creamy, and not too tart. Every spoonful is so satisfying! 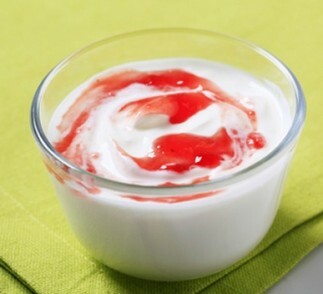 Of course, VOSKOS® nonfat is also very healthy – in fact, it’s as healthy as yogurt can get. Chock full of protein, calcium and probiotics and no added sugar. It’s certainly better than those commercial brands in the store that add obscene amounts of sugar, not to mention gelatin and flavorings, to their products. But I know that not everyone enjoys the taste of plain, nonfat yogurt. So what to do if you don’t want the sugar-laden stuff from the store, you know that nonfat plain is the healthiest, but you still find that it’s too bland and not flavorful enough to eat as is? Flavor it naturally! The advantage of doing that is that you start off with the cleanest of foods, then add just the amount you need to make it more flavorful. So you know exactly what gets into your body, and you are in control of how sweet the end result is. 1. Honey. This one is a classic. Pour a tablespoon of honey over 8oz plain nonfat VOSKOS® and mix well. 2. Jam. As simple as honey, simply add a tablespoon of jam to 8oz plain nonfat VOSKOS® and mix well. 3. Mashed fruit. I love mashing a ripe banana and adding it to my VOSKOS® plain nonfat. 4. Raisins. Raisins are fun because they add chewiness in addition to flavor. 5. Dark chocolate. Melted and swirled into the yogurt, or use a tablespoon of chocolate syrup. 6. Peanut butter. Use a hand-held whisk or a fork to whip 8oz VOSKOS® Plain Nonfat with 1 tablespoon peanut butter. Add a teaspoon of chocolate syrup for some extra indulgence! 7. Chocolate chips. Use dark chocolate chips – dark chocolate is actually good for you, in moderation. 8. Granola. A quarter cup of granola adds just the right amount of sweetness and crunch. Of course, you can always opt for YoGreek, dual-cup Greek yogurt that comes with pre-measured crunchy granola! 9. Stevia and Vanilla. To create your own vanilla yogurt and keep it low in calories, add stevia to taste and a drop of vanilla extract to your VOSKOS® Plain Nonfat. 10. Apple butter. Mix one tablespoon apple butter into your VOSKOS® Greek Yogurt for a fruity, creamy, wonderful treat.